I was just outside taking down the last of my Christmas Lights. I was within a few feet of my hummingbird feeder and as usual there was one coming and going to feed. Normally I see three hummingbirds around. At one point there were two hummers flirting around the feeder when all of a sudden I heard this "vroom" noise. I looked around for the unknown bird that might have made the noise but did not see anything and continued to pick up my Christmas lights. A few seconds later I heard the "vroom" noise again and it seemed to hit the side of my house and explode! And it happened again, but this time I realized the noise was originating from a bird across the street, about 100 feet away!! All this time the two hummers were around the feeder, so I am wondering was it my 3rd hummer trying to warn the other two of my presence? Though they have never seemed to have been bothered by me before. The noise the third bird was making sounded like a normal bird sound, until it hit the side of my house and literally exploded into a different and much louder noise. Can hummingbirds do this? Project and direct their voices like that? Or what kind of bird could it have been? 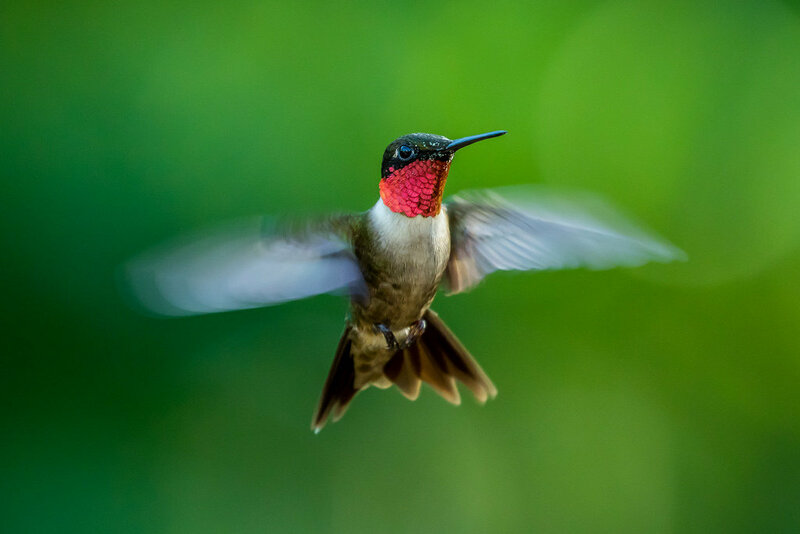 When hummingbirds fly past you close to your head they can sound like tiny jet engines. Is there any chance that's what you heard? I often don't see the hummer, just hear the roar as it flies past and disappears. They are very fast and agile, and can turn and reverse their direction amazingingly quickly. Mine will do this if they come in to visit my feeders and I startle them wiht a sudden movement (like you said, they are used to me, so if I'm reasonably still they come in to feed even when I'm there.) Sitting in a tree across the street to wait for their chance at the feeders is very normal behavior for them. They will fly in to feed and then seek a spot with more cover. And it's more likely that the hummers were fighting among themselves than worried about you. Hummers tend to be very protective of their food sources, and will chase others away and even peck at them to keep them from "their" feeders. Where are you? What kind of hummingbirds are you getting at your feeders? Yes, I know the sound of what they sound like when they fly by my head...as they did it this morning and lots of other times. This was definitely not the sound of wings. This was definitely a bird or other animal making a sound from across the street and then its sound wave striking my house/window as I heard both noises about 5 times in a row. I'm having trouble imagining what the "vroom" noise sounded like. Did it sound like a car revving its engine? Was it extremely loud? And how did you come to the conclusion that it was an animal making the sound (and not the neighbor's kids )?